184€ 1900mm Ø24mm 400g High quality Nemeth SC javelin. Recommended for technically beginner throwers, students and master athletes. Good compensation in case of inaccurate release. 179€ 1900mm Ø24mm 400g High quality Nemeth SC javelin. 174€ 1900mm Ø24mm 400g High quality Nemeth UT javelin. Recommended for technically beginner throwers, students, master athletes. Good compensation in case of inaccurate release. Suitable for practices. 178€ 1700mm Ø20mm 300g The 300 g Nemeth aluminum javelin with a blunt tip is specifically designed for children to accommodate their young age and physique. Excellent visibility - light reflective text. Assures landing with tip.Firm grip, very durable. Recommended for children, who are just getting to know the art of javelin throwing. 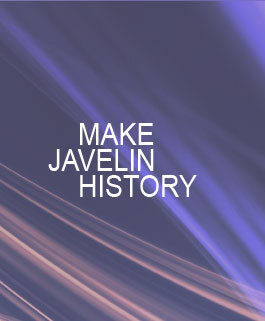 You can download our Aluminum 400g & 300g Javelins catalogue here: Aluminum 400g & 300g Javelins Catalogue.